Finding The Islander was like coming home. This is what I remember the East Midlands being like. This is the sort of place Shane Meadows would use as a setting and tug at your heart strings and make you laugh. Fantastic place. 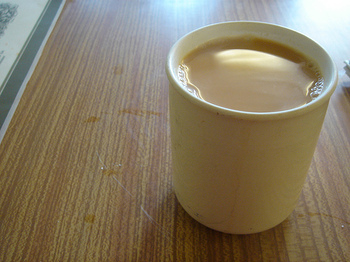 A strong, stirring, no-nonsense cup of tea. If this doesn't cheer you up you're Morrissey. What a brilliant sign. What else do you need to know? 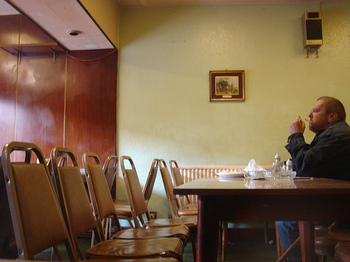 I took these pictures ages ago, May 2007, pre-smoking ban. I wonder how they're coping now? 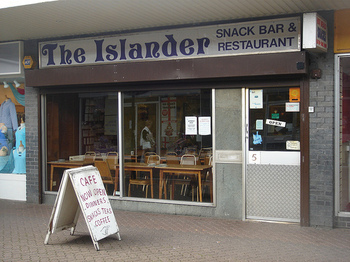 The Islander was a place that didn't mind a proper smoker. It was part of the atmosphere. 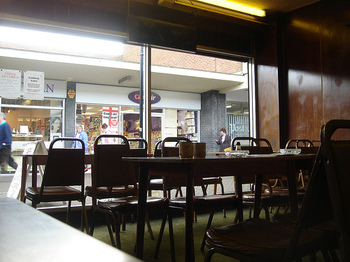 You can probably see the enormous ashtrays on the tables, smoking wasn't just part of the atmos, it was part of the furniture. Fantastic utilitarian furniture. 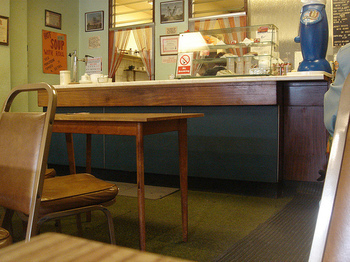 This isn't about nostalgic design, this is a working cafe. 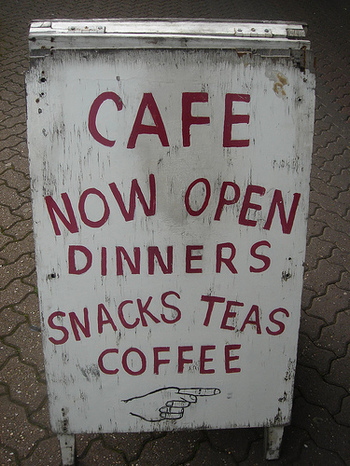 It's about decent grub, reasonable prices and being able to take your time over a cuppa. Brilliant. It's good to see that you're back in action! May we have a picture 'post-smoking-ban', to see what, if any, difference the ban has made? I always feel so sorry for smokers huddling outside in the cold, desperate for their gaspers. Whay can't they be given their own corner inside? hey russell. came across your blog through the guys at big al's creative emporium. I went to school in Uttoxeter, and have just written a song about the place. How the hell did you end up in the maltings?